An artist’s impression of the Resorts World at Sentosa. Robin Goh (inset) says the economic downtu rn has not affected the progress of construction works. PETALING JAYA: Resorts World at Sentosa (RWS), built at a cost of S$6bil (RM14.34bil) by Genting Bhd, is on track for opening early next year despite the global financial crisis. According to Resorts World at Sentosa Pte Ltd assistant vice-president Robin Goh, the economic downturn has not affected the progress of construction works. 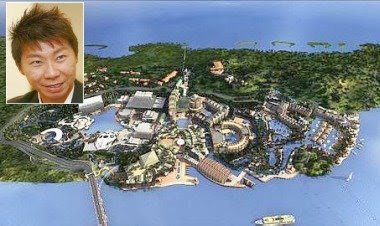 He said RWS would be the only casino resort in the world with two world-class attractions - South-East Asia’s only Universal Studios theme park and Marine Life Park, the world’s largest oceanarium. “No other casino offers such a strong, integrated one-stop proposition which will be highly attractive to family travel, a substantial segment in the region. “We believe that Resorts World’s proposition as a complete destination is its key differentiation from Macau, which is still very skewed towards gaming,” he told StarBiz. “Macau only has casinos and big hotels whereas RWS will be home to some of the world’s leading attractions, including the Universal Studios theme park which will occupy almost half of the resort,” he said. He said the theme park would feature 24 movie-themed rides, 18 of which were designed exclusively for Singapore. “Among them is the world’s tallest pair of duelling roller coasters, the “Transformers” ride and hot favourites given a new twist, such as Revenge of the Mummy, Jurassic Park River Rapids and the Waterworld Stunt Show,” he said. Based on the blockbuster movie, the “Transformers” ride is the world’s first and is scheduled to debut at Universal Studios Singapore and later at Universal Studios, Hollywood, both in 2011. RWS will also be home to Mark Burnett Productions Asia, which will set up studio facilities where game shows will be filmed. The 49ha resort will also feature a FestiveWalk, Marine Life Park and Maritime Xperiential Museum. “Marine Life Park — sited on 8ha and filled with 20 million gallons of water — will be the largest oceanarium in the world,” Goh said, adding there would be over 700,000 marine creatures and opportunities to hand-feed tiger sharks from an enclosed cage. Just a 20-minute ride from Changi airport, RWS will also be able to host over 12,000 delegates in three formal meeting locations at any one time. “We would be able to do something which has never done before in the region. We propose to bring delegates on rides and show them what goes on behind the scenes. So people will get to see the magic behind how we scare people,” Goh said. The resort is expected to welcome 15 million visitors in the first year of operations. Goh said a S$4bil (RM9.57bil) credit facility to fund the project was secured last April. It was one of the largest syndicated credit deals undertaken in Singapore and was completed in less than four months, he said. Underwritten by five local and international banks, the successful and swift process of securing the credit facility reflects the support and vote of confidence that the banks and financial institutions have in RWS,” Goh added. He said the company had awarded most of the major construction contracts for the resort. “To date, we have awarded S$3bil (RM7.18bil) worth of contracts, including those for Universal Studios, four hotels, the casino, and FestiveWalk,” he said. Goh said Malaysia remained one of RWS’s priority markets. “We are reviewing our pricing and packages, taking into account the price-sensitivity of the market and the current economic situation,” he said. The rates and packages would be revealed later in the year, he added. JOHOR BARU: Daiman Development Bhd is scaling back on new products and launches this year as the local property market cools down. General manager Siah Chin Leong expected most local developers to adopt a similar move as they were not willing to take any business risk. Hopefully, the unemployment rate in Malaysia would not rise as this would affect the whole market since the disposal income would be vastly reduced, he said. Siah said developers in Johor were already facing a tough time and most had experienced a 40% decline in sales in the past two months. “Everybody, including developers, is pessimistic. They don’t know what lies ahead in the next two years,’’ he said in an interview with StarBiz. Siah said Daiman would be launching 87 double-storey cluster houses and 26 double-storey semi-detached houses in Taman Gaya in the fourth quarter of its financial year ending June 30 (FY09). The company is currently building 132 double-storey cluster houses and only a few units are still unsold. It also just started building 120 single-storey terrace houses with an average selling price of RM158,000 unit and 60 double-storey shop offices at RM398,000 per unit at Taman Daiman Jaya. “We are looking at RM130mil gross development value (GDV) for the 425 units and they will keep us busy for the next two years,’’ said Siah. Daiman has three major on-going projects - Taman Gaya along the Tebrau corridor, Taman Daiman Jaya in Kota Tinggi and Taman Perindustrian Murni in Senai. Taman Gaya will take six to seven years to complete and Taman Daiman Jaya, between 15 and 18 years. Both projects have so far contributed RM428mil in sales turnover. About 40% of its industrial lots and factories in Taman Perindustrian Murni have been sold and contributed RM12.09mil at the end of FY08. Daiman has leased out some of its factories which are fetching an annual yield of 6% to 7%. 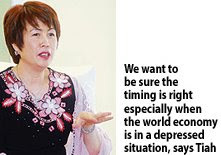 Siah said despite a slowdown in the local property market, there was encouraging response to high-end properties. Daiman was targeting professionals, senior executives, extended families and those looking for bigger houses, he said. “These buyers are willing to pay more for their houses provided they are located within gated and guarded precincts,’’ he said. Daiman was on the lookout for land in Nusajaya as the area would be the main growth centre in Iskandar Malaysia, Siah said, adding that its focus here would be high-end houses. He said Daiman had over the past few years been looking for land in the Klang Valley but so far the land viewed was not feasible. The company is also considering venturing into Singapore as demand for private properties there was still good due to the influx of wealthy buyers from worldwide to the republic. Last April, the company’s wholly-owned overseas subsidiary Caversham Universal Ltd subscribed to 70% equity in CNES Property Pty Ltd for A$875,000. Australia-based CNES was incorporated in February 2008 and its principal activity is property development. It plans to build some bungalows in Perth. “We are very cautious when expanding overseas but if it is a sound investment, Daiman will definitely explore the possibility,’’ Siah said. Daiman has some 36 years experience in the property sector in Johor and had net cash of RM74.22mil at the end of FY08. For FY08, it recorded RM114.46mil in revenue while the pre-tax profit was RM36.43mil. That compared with RM99.81mil and RM37.99mil respectively in FY07. Bayu Ferringhi, a property development in Penang, has received good response following its recent launch. The project has attracted 11 bookings for its villas and 37 for the condominium project. Bayu Ferringhi is being developed by Plenitude Heights Sdn Bhd, a wholly-owned subsidiary of Plenitude Bhd. "We believe that Bayu Ferringhi will attract substantial foreign interest. "We are honoured to play a positive role by developing properties which have an international appeal while supporting the government's, "Malaysia My Second Home" initiative," said Plenitude executive chairman, Chua Elsie. 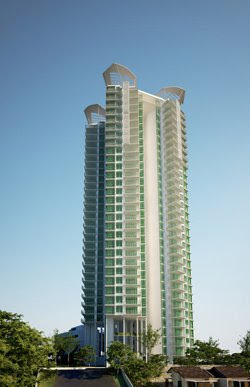 Bayu Feringgi is a freehold project on an approximately 4.45 hectares- site along Jalan Batu Ferringhi. 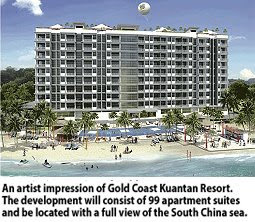 It comprises 44 luxurious semi-detached villas and 112 condominium units within a lush tropical seaview setting. Prices start from RM1,762,000 for semi-detached villas and RM761,000 for the condominium units. SIME Darby Property Bhd will be giving "ang pow" treats to house buyers of the Bandar Bukit Raja township between January 26 and February 9. Ang pows worth RM3,888 will be given to all intermediate house buyers and RM6,888 to those who purchase the end and corner units, the company said in a statement. Sime Darby Property said Bandar Bukit Raja will be launching their latest Avira and Levena double-storey link units from RM325,888 with a built-up area of 1800 sq ft and RM388,888 for a built-up area of 2280 sq ft respectively. In conjunction with the "Chap Goh Mei" celebration, a feng shui talk by Joey Yap will take place on February 7 and 8 and free personal consultations will be held on both days. Sprawled over 161.87 hectares, the Bandar Bukit Raja development is an integrated township comprising residential homes, schools, shops, medical and commercial centres. To date, Bandar Bukit Raja has sold over 3,500 residential and commercial units and has over 10,000 residents. Upon completion of Stage 1, Bandar Bukit Raja will comprise some 7,800 residential and commercial units. INVESTORS should buy Hektar Real Estate Investment Trust because of its high dividend yield and the share is now trading at a low price to net tangible asset of 0.7 times, Standard & Poor's said. The 58 per cent fall in its share price from a high of RM1.74 to the recent low of 73 sen is overdone, S&P said, given that it is not facing any re-financing or sharp asset devaluation issues. "At the current level, HektarREIT offers a more attractive dividend yield of 13.4 per cent compared with the average yield of 9.5 per cent for its peers," analyst Tam Ching Wah wrote in a report. Suburban neighbourhood retail properties also enjoy more stable occupancy and rental income than other types of commercial properties such as offices and urban retail properties, the report said. S&P has initiated coverage on Hektar REIT with a "buy" recommendation and a 12-month target price of 95 sen. Its shares closed 3.5 per cent up at 88 sen on Bursa Malaysia yesterday. The prospects for Hektar REIT are positive, S&P said, given that there are 34 cities in Malaysia with sufficient population to support one regional or neighbourhood mall such as Subang Parade and Mahkota Parade, both owned by the fund. Hektar REIT plans to either develop greenfield shopping malls or take over existing ones and refurbish and revive them into modern malls. S&P said the entry of Fraser and Neave Ltd as one of its major shareholders augurs well for Hektar REIT since F&N will bring along its reputation and expertise to help it build a chain of neighbourhood malls throughout Malaysia. "Hektar REIT does not have any re-financing issues in the near term. Its total borrowings of RM301.5 million will only be due in 2011 and 2013. Furthermore, interest rates are expected to decline further over 2009," S&P said. LONDON: Britain’s two biggest property companies, British Land Co Plc and Land Securities Group Plc will sell £750 million (£1=RM5.13) worth of retail assets within weeks, The Times newspaper reported yesterday. British Land is close to selling a 50 per cent stake in the Meadowhall shopping centre, Sheffield, for about £550 million to a joint venture between an Abu Dhabi fund and Aim- listed London & Stamford Ltd, while Land Securities is nearing completion of a deal to offload a one-third stake in the Bullring shopping centre in Birmingham to an Australian government fund, for £200 million. MULPHA Land Bhd (MLB) (7889) is launching four high-end projects worth RM1.03 billion in Kuala Lumpur and Johor this year, in a bid to turn around. MLB slipped into the red in the 12 months to December 2007, incurring a net loss of RM417,000 against a net profit of RM864,000 in 2006. For the first nine months in 2008, MLB, the property arm of Mulpha International Bhd, posted a net loss of RM94,000. Chief executive officer Lai Meng told Business Times in an interview that the way forward for MLB is to offer niche and sought-after products. 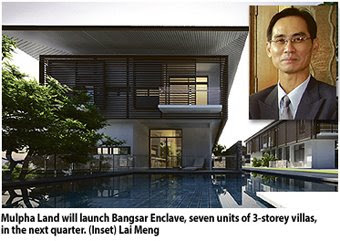 It is launching Bangsar Enclave in the next quarter, which features seven units of 3-storey villas in a gated and guarded community, worth RM70 million. In the second half of the year, MLB will launch Menara Mulpha at Jalan Sultan Ismail, and a yet-to-be-named luxury development in Kenny Hills, offering eight unique villas with private pool, worth RM110 million, or RM15 million each. Menara Mulpha is a 23-storey Grade A office building, worth around RM350 million. The property, which is the first iconic building with green features for the Mulpha Group, will be leased for recurring income, Lai said. "These projects have strong unique product concept in superb locations and should provide impetus for growth. Nevertheless, we are mindful of the gloomy economic outlook and will adopt a cautious approach in our planning and execution," he said. Also in the pipeline is Precinct 7 at MLB's RM1.2 billion Leisure Farm Resort project in Gelang Patah, located in Iskandar Malaysia, Johor. It will offer 320 units of semi-detached homes and bungalows, surrounded by garden parks and canal waterways, worth a combined RM500 million. 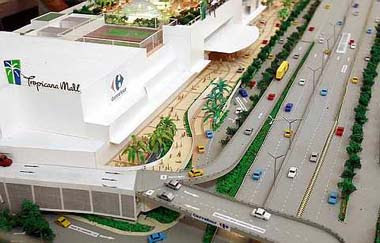 "Precinct 7 will be developed in phases to enhance price positioning," added Lai. MLB is also banking on its recently refurbished and restored project, opposite the Raintree Club in Ampang Hilir, to improve earnings. Dubbed Raintree Residence, it has four semi-furnished 5-bedroom duplex penthouses, and eight units of 4-bedroom apartments, which will be leased. "It will be our first rental product in Kuala Lumpur and should be favourable in this locality filled with expatriates and consulate staff," Lai said. MLB's current projects are Bukit Punchor in Nibong Tebal, and Desa Aman in Padang Meha, Kulim, Kedah, worth RM706 million. 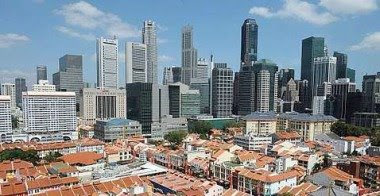 Stockbroking firm TA Enterprise Bhd (TAE) may delay plans to list its property unit on the local bourse for the second time, due to a weak stock market, industry sources said. TAE, which has the Securities Commission's nod to list TA Global Bhd (TAGB) on Bursa Malaysia's main board by March, may list it in the second quarter in view of current market sentiment, a source told Business Times. Its earlier target was to list TAGB by December 2008, later postponing it to March this year. When contacted, TAE group managing director and chief executive officer Datin Alicia Tiah told Business Times that the group is still aiming to list TAGB by March or April, but the plan will be guided by market sentiment. "While we are optimistic to list the property business, we want to be sure the timing is right especially when the world economy is in a depressed situation. TAE is expanding its property business and the listing will give it more recognition overseas as it expands," Tiah said. She said TAE is talking to underwriters for the placement of the shares, and exploring the best way to structure the initial public offering (IPO) so that the market will be able to absorb the listing. "Our approval has an expiry of six months. In the event we do have to delay the IPO, we can always apply for an extension," Tiah said. TAGB's listing exercise involves a proposed rights issue of 860 million new shares and a public issue of 350 million new shares at 50 sen per share. TAE is proposing to sell its property units to TAGB in an all-share deal and raise about RM613 million. It will inject its property assets held under TA Properties Sdn Bhd; Sanjung Padu Sdn Bhd; Wales House Trust, which owns the Radisson Plaza Hotel in Sydney; and Taman Duta Residences, in exchange for shares worth RM1.75 billion in TAGB. TAE is also proposing a capital distribution to its shareholders that will cut its share capital, share premium reserve and retained earnings. As a result, its par value would be reduced to 50 sen from RM1 currently. Upon completion of the proposed capital distribution and listing, TAE will hold at least 24.3 per cent equity interest in TAGB. TAE will also use part of the proceeds to apply for an investment banking licence, and the rest for its future working capital. The proposed RM11 billion commercial and residential development in Shenyang, China, that will utilise Syariah-compliant financing from Malaysian banks is on track despite the current global economic downturn. Islamic Banking and Finance Institute Malaysia (IBFIM) managing director and chief executive officer Datuk Dr Adnan Alias said the report on the feasibility study of the project is nearly completed. "We will present the report to the Shenyang Governor next month when we meet in Singapore," he told Business Times when asked about the progress of the project. Themed "Modern Islamic Lifestyle", the proposed development is expected to commence by the end of this year and be completed within five years. 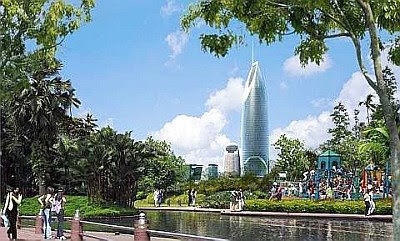 The project would take place in the Shenyang Finance and Trade Development Zone. It will be developed on a 17.96ha site in one of the most centralised Muslim community living areas in China. A special purpose vehicle, known as Shenyang-Malaysia Development Sdn Bhd (ShenMas), was formed in November last year to undertake the conceptual planning, land acquisition, funding issues and feasibility studies. A consortium of Malaysian builders, including Bina Puri Group, will be involved in the development of the project. China, one of the world's fastest growing economies, plans to woo Islamic banking and finance institutions to the country by establishing an Islamic finance hub. WASHINGTON: An unexpected improvement in US home sales provided a rare dose of good economic news on Monday, but companies continued to wield the axe on jobs as the year-long recession inflicted more pain. The pace of sales of previously owned homes rose for the first time since September and inventory declined, a bit of positive news amid a US housing market crash that has chilled growth, sent unemployment soaring and sharply eroded household wealth. Sales of previously owned US homes increased 6.5% to a 4.74-million-unit annual rate in December, the National Association of Realtors said. Analysts polled by Reuters had expected sales to set a 4.40 million unit pace. 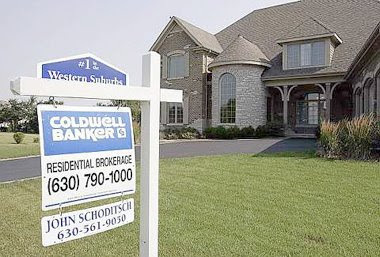 Analysts said the uptick was encouraging and might be a signal the worst housing bust in decades was finally nearing a bottom following government steps to slow foreclosures and cut interest rates on home loans. “Though unlikely to mark the bottom of the housing downturn, the report at least suggests the market is not spiraling downwards in response to mounting job losses and tightening credit standards,” said Sal Guatieri, an economist at BMO Capital Markets in Toronto. US government bond prices and the dollar fell as the housing data eroded their safe-haven appeal, encouraging investors to seek riskier assets. Stability in the US housing market, the root cause of the worst financial crisis since the Great Depression, is seen key to any recovery in the domestic economy which has been stuck in recession since December 2007. December existing-home sales were largely driven by distressed sales, which dragged the median national home price down 15.3% from a year earlier to US$175,400. The chief economist of the National Association of Realtors, Lawrence Yun, said it was the largest price drop since NAR started keeping records in 1968 and probably the largest since the Great Depression. “There is pent-up demand, which could be unleashed with the right stimulus. The Obama administration and Congress need to move fast … to stabilise home prices and set the foundation for a sustainable economic recovery,” Yun said. US President Barack Obama is drumming up support for an US$825bil spending package, which he hopes will kick-start the economy and create or preserve three million to four million jobs. Analysts were also heartened by the 11.7% drop in the inventory of existing homes for sale to 3.68 million units from 4.16 million in November. That translated into 9.3 months of supply at December’s sales pace. The supply stood at 11.2 months’ worth in November. “It suggests we are working through some of the inventory, which is the first thing to happen before we see any kind of housing recovery,” said Frank Lesh, futures analyst at FuturePath Trading in Chicago. Separately, the Conference Board said its index of leading economic indicators rose 0.3%, beating analysts’ forecast for a 0.3% decline. Economists attributed the rise to the improvement in credit markets, thanks to the action by the Federal Reserve. The Fed has cut interest rates almost to zero and pumped hundreds of billions of dollars into financial markets to keep them operating. The Fed is expected to hold its target range for the key overnight federal funds rate steady at zero to 0.25% at the end of its two-day meeting today. Tony Crescenzi, chief bond market strategist at Miller, Tabak & Co, reckons that given the recent uptick in government bond yields and mortgage rates, the Fed could place emphasis on its plans to buy mortgage securities and possibly Treasuries. PROPERTY developers are finding new ways to boost sales as they grapple with a slowing economy and fragile consumer confidence. OSK Research analyst Mervin Chow said more developers will offer incentives, especially for landed properties, to boost sales. "There is more competition. So developers will have to do something new to survive. They may offer more giveaways or discounts," he said. 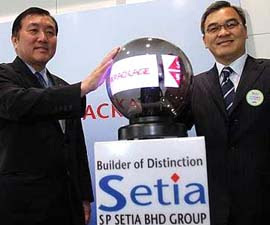 SP Setia Bhd yesterday unveiled a scheme that halves the downpayment on a house to five per cent. Rival Mah Sing Group Bhd is set to follow with its own plan this week. Group managing director and chief executive officer Tan Sri Liew Kee Sin expects a good reaction to its Setia 5/95 Home Loan package, which is available until April 19. "We had soft launches recently (at Setia Alam) and the responses have been good. People have money but are shaken a bit. So sales have been slow. There are some cases where buyers cannot get loans. This is why we came up with the 5/95 package to assist them to own a home," Liew said. 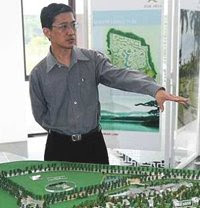 Liew was speaking to reporters after launching the 5/95 package with Housing and Local Government Minister Datuk Seri Ong Ka Chuan at the Setia Alam township in Shah Alam, Selangor. The package requires buyers to make a 5 per cent downpayment on a property with no interest payable during construction. The buyer only starts to service the 95 per cent loan when the property is completed. The campaign is supported by CIMB Direct Access, Maybank, Public Bank and EON Bank and is applicable to all of SP Setia's residential properties in the Klang Valley, Penang and Johor. As for Mah Sing, it will launch its easy ownership campaign on Thursday. Under the campaign, buyers can buy completed semi-detached homes or bungalows with a RM1,000 deposit, and thereafter pay a minimum of RM1,200 a month for the next five years. They will enjoy an attractive loan interest package from the fifth year, Mah Sing senior manager, corporate communications, Lyanna Tew said. Last year, Sime Darby Property Bhd (SDP) sold 241 properties worth RM141 million in one month, at its 10 ongoing townships. Sales were boosted by its Guaranteed Buy Back scheme, which is valid until June 15. Under the scheme, buyers can sell back their properties to SDP with "no question asked". Minister of Housing and Local Government Datuk Seri Ong Ka Chuan (left) and SP Setia Bhd group managing director and chief executive officer Tan Sri Liew Kee Sin at the launch of Setia 5/95 Home Loan Package on Monday. 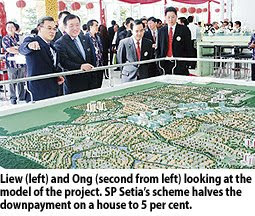 SHAH ALAM: In the current difficult times, SP Setia Bhd has come up with a scheme to make it easier for buyers to own homes. And four local banks – Malayan Banking Bhd, Public Bank Bhd, CIMB Bank Bhd and EON Bank Bhd – have committed more than RM1bil to provide financing facilities to the company’s new 5/95 Home Loan Package. Under the package, buyers need only make a downpayment of 5% and the balance is payable upon completion of the property. Under the 10:90 variant of the build-then-sell system, buyers have to make a downpayment of 10% of the property cost. Besides the banks’ support, the group also had RM600mil in cash to fund the campaign, he said after the launch of Setia 5/95 Home Loan Package by Housing and Local Government Minister Datuk Seri Ong Ka Chuan yesterday. The three-month campaign ends on April 19 and is applicable to all SP Setia’s residential properties in the Klang Valley, Johor and Penang. SP Setia would also bear other entry costs such as legal fees, stamp duty on the sale and purchase agreement and loan agreement as well as memorandum of transfer for purchases under the campaign. “We believe Malaysians are still looking to buy and have the purchasing power to do so but got shaken a bit by the current market,” Liew said. He added that the company had received “very encouraging” response from buyers to the promotion it introduced two weeks ago. Ong said the Government encouraged developers to embark on build-then-sell system. “As the country faces pressure from the global financial meltdown, Malaysians have become more cautious in spending. By introducing this 5/95 package, I believe SP Setia has managed to work out the right mechanics to offer prospective homeowners an attractive plan that is difficult to ignore,” he said. However, Ong said the Government could not fully implement the build-then-sell system yet as smaller developers might find difficulty in securing loans from financial institutions to start a housing project. 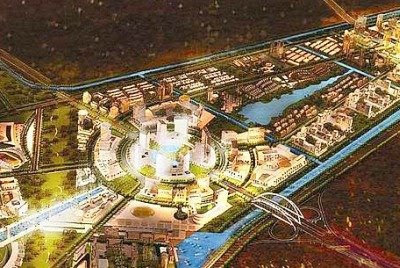 The Government, he added, would provide incentives including fast-track approval for projects of developers who opted for the concept. PETALING JAYA: Prices of most construction building materials are likely to remain stable this year amid slowing demand and lower production costs on falling commodity prices. Master Builders Association Malaysia (MBAM) president Ng Kee Leen predicted prices of all construction materials would eventually drop closer to the levels before the fuel hike in June last year. He said the current prices should stay stable unless the Government made drastic changes to the base materials prices. “Government policies have to be consistent and predictable, as investors dislike uncertainty,” he told StarBiz yesterday. Ng also said MBAM’s ongoing discussion with cement manufacturers on price reduction was encouraging and the association was confident of a positive outcome. Meanwhile, National Ready-Mixed Concrete Association of Malaysia on Sunday announced a 5% price reduction for ready-mixed concrete effective Feb 1. 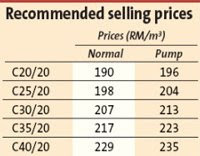 It said the new recommended selling prices would be applicable in Kuala Lumpur and Selangor. Transportation charges and steel bar prices have been revised several times since last year. Ng said prices of domestic steel bars had declined to about RM1,900 per tonne, which was about RM200 per tonne above the imported steel price. He estimated domestic steel demand at about 2 million tonnes in 2009. However, since the conditional steel import liberalisation on May 12, the import of other steel products, for both the construction and non-construction industries, had faced new setbacks such as higher import fees, more frequent product testing and longer importation procedures, he said. “It (import of steel products other than steel bars) has become less efficient and unproductive,” he said. On the RM7bil stimulus package and the second scheme, Ng hoped the Government would implement them quickly. “New contracts must start entering the market as many ongoing jobs were awarded in 2007 and will be completed soon. If not, the construction industry will be affected in 2010,” he said. He said the impact of the stimulus package would be felt only in the second half of 2009. An analyst with Maybank Investment Bank Bhd who has an “underweight” on the construction industry this year projected that construction materials, whose prices had fallen since the fourth quarter of 2008, would not revert to an uptrend anytime soon. She forecast the domestic construction industry would remain quiet this year, while local construction companies with overseas projects such as in the Middle East could risk jobs cancellation and potential delayed payments. She added that construction material costs in India had not come off as quickly as in Malaysia. She also predicted international steel prices to average US$600 per tonne in 2009 from around US$400 per tonne currently. See Hoy Chan Holdings is unlikely to renew a lease that lets Aeon Co (M) Bhd manage the first phase of the 1Utama shopping complex in Bandar Utama, Petaling Jaya. The 15-year lease between Aeon and See Hoy Chan, which owns the shopping complex, will end sometime next year. Aeon, operator of the Jusco department stores, manages the first phase, which opened in 1995, handling two million sq ft of gross space and 680,000 sq ft rentable area. The second phase, with three million sq ft of gross space and 1.2 million net rentable area, is owned and operated by the developer See Hoy Chan. It opened in December 2003. "We are negotiating a new arrangement with Jusco," See Hoy Chan director Datuk Teo Chiang Kok told Business Times. "We prefer to run it on our own to present the mall as an integrated and wholesome centre," Teo said. Nevertheless, See Hoy Chan would like Aeon to continue being its anchor tenant. 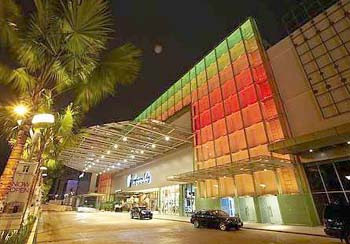 Apart from the department store and supermarket, Jusco also operates the Jusco Home Centre and Jeans Studio in 1Utama. Aeon derives its revenue both from retail sales and mall management. According to Aeon's website, there are 21 Jusco stores in the country, of which 16 are located in shopping complexes which it also manages. 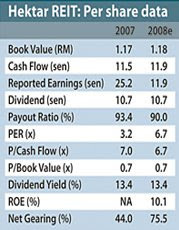 In the first nine months ended September 30 2008, Aeon posted RM75.77 million profit on RM2.5 billion revenue. Profits from retail operations (before tax) accounted for RM70.66 million and from property management, RM46.49 million. What is your outlook on the domestic property market in 2009? The property market is likely to soften in 2009 unless the global economy is able to recover swiftly. There is an expected downward adjustment in property prices in general, but I believe prices in prime locations will hold out relatively well. A rational property buyer with a long-term perspective would believe that Malaysia’s properties are still at an attractive and sustainable (price), as opposed to a lot of the other cities in the world. The Malaysian property market is much more resilient as financial institutions have been more prudent in project lending. Property companies today are also better capitalised, as stringent regulations are in place by both financial institutions and regulatory bodies, reducing the risk of widespread abandoned projects. The other stabilisation factor has been the strong mortgage market, largely driven by domestic consumption and the young population. The local mortgage market remains resilient, thus maintaining access to relatively cheap home financing, ensuring the property market remains attractive. With strong macroeconomic fundamentals, ample domestic liquidity and relatively robust job market, the belief that Malaysia will avoid ‘property price crash’, in my opinion, would hold true. When do you think the domestic demand for property will pick up? It is difficult to be certain when the property market will pick up again. However, I am optimistic it will ride out this uncertainty over the next two to three years and may return to a ‘boom market’ in the next four to five years. Lessons learned from the current economic turmoil? We can draw two important lessons. The first is the immutable fact that we are becoming a ‘globalised’ nation. At Ireka, we have always acknowledged the importance of thinking global in whatever we do, venturing into Vietnam while staying focused in Malaysia. We will monitor the market very closely throughout 2009 and undertake in-depth feasibility studies, especially before embarking on new product launches. We now have Mont’ Kiara as our i-ZEN branding showcase, providing us with the necessary experience and expertise to expand to new locations, such as Vietnam. We will take a cautious yet opportunistic approach so that we will be in an advantageous position when the market recovers. The second lesson is the vitality of ‘change’. ‘Change’ will be the guiding principle for the world economy in 2009 as we start to redesign the entire global financial architecture and change the way most financial businesses operate. Our mantra for 2009 will be to ‘Embrace Change.’ It is no longer adequate for us to undertake tasks in a conventional manner – be it business decisions, branding platforms, marketing and sales strategies or product innovations. The slowing economy has made it harder for consumers to part with their cash. However, our partnership with reputable property players such as CapitaLand of Singapore as well as leveraging on our i-ZEN brand of properties have provided greater value for each development and encouraged repeat buyers for our projects. Business strategies for Ireka in the next two to three years? Ireka will focus on its two main core businesses – construction and property development. Over the next two to three years, Ireka will focus on completing its four construction projects in Malaysia with a total order book of RM1.14bil, which will help the group maintaining a healthy revenue inflow up to 2011. Ireka will continue to focus on providing integrated design-and-build services. With an experienced team, Ireka is able to ensure cost and resources are optimised. With prudent cost management, the group hopes to achieve healthy margins while delivering completed projects in a timely manner. On the property development front, Ireka will continue to earn a management fee from Aseana Properties Ltd (Ireka holds a 19.6% investment stake in Aseana) as its exclusive development manager. We will focus on completing projects like Tiffani by i-ZEN by the third quarter of this year. For new projects, it is important for us to continue undertaking detailed market studies on the specific target markets. Innovative, targeted marketing strategy and branding initiatives are important steps to ensure that we focus on reaching the right audience. ANALYSTS remain upbeat on the real estate investment trust (REIT) market, with Axis REIT being one of the more favoured stocks. The company is expected to release its full year results this Thursday for FY08 ended Dec 31. An analyst with HwangDBS Vickers Research said Axis REIT was expected to deliver dividend per unit of 14.3 sen, or 12% gross yield, compared with 11% industry average in FY08. Despite the weaker property market, it was anticipated that there was little risk of asset devaluation and tenancy non-renewals for Axis REIT given its diverse tenant mix, where only 19% of leases will expire in FY09 forecast. “However, we have trimmed our FY09 and FY10 forecast net distribution by 8% and 9% respectively to reflect flat rental growth and one percentage point increase in interest cost, but maintain a “buy” call on Axis REIT for its strong operating cashflow and attractive 12% yield,” the analyst said. He said Axis REIT’s tenant mix comprised of 55% of properties in Petaling Jaya, 21% in Johor, 15% in Shah Alam and 5% each in Klang and Kedah. “About 75% of Axis REIT’s properties are offices and warehouses, and the locations and tenant mix should cushion the REIT against a slowdown in demand in any one particular market segment or location,” he said. The analyst said Axis REIT’s properties achieved 11% average gross property yield for 2008 and only about 19% of its leases were due for renewal in FY09. “The tenancy renewal risk is low,” he said. On the company’s expansion plans, the analyst said Axis REIT was unlikely to proceed with its planned placement of up to 120 million new units in the near term due to the weak market sentiment. “Given its 33% gearing against the maximum allowable limit of 50%, we conservatively assumed that there will not be any acquisition for Axis REIT in FY09 to FY10. Management will only consider new purchases if they are accretive to unitholders,” he said. On financing issues, the analyst said Malaysian banks were unlikely to pull back credit lines for properties with secured long-term tenants. Property developer SP Setia Bhd is confident of securing more sales this year with the introduction of its new 5:95 home loan package, its group managing director and chief executive officer Tan Sri Liew Kee Sin said today. The package is expected to attract more buyers despite the economic slowdown as it offers a build-and-sell concept, Liew said. “We had the soft launch last two weeks ago and the response was very encouraging,” he said. Speaking to reporters after the launch of the package in Shah Alam, Liew said the concept required buyers to pay only five per cent of the purchase price and the remaining 95 per cent after completion of the property. Legal fees, and stamp duty are also waived for the consumers under the new loan package, he said. He added that the loan package will be applicable to all residential properties in the Klang Valley, Johor and Penang for three months starting today.